There’s an eclectic choice of collectable and unusual classics in BCA’s next Classic & Historic sale, including a rare Porsche 930 ‘Flatnose’, a one-off luxury sports saloon and 1959 Jaguar XK150 Coupe formerly owned by renowned racer, John Appleton. The sale is being staged at BCA Blackbushe at 12 Noon on Tuesday 2nd October 2007 and a fine selection of vehicles will be on offer dating from 1923 to 2003. The 1986 Porsche 930 ‘Flatnose’ is a UK supplied right-hand drive model featuring a particularly impressive specification. 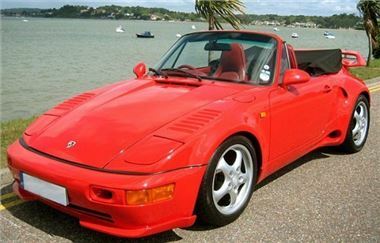 Finished in Guards red, it is an original factory ‘flatnose’ 930 Turbo and has the G50 5-speed gearbox, full red leather seats, cup-type alloy wheels, stainless steel exhaust system, Sony radio/cassette head unit with Kenwood amplifier and 10-stack CD multi-changer. For peace of mind, a Tracker GPS security system is fitted, a Cobra Category 1 keyless entry alarm/immobiliser system has been installed, plus a further Cobra manual default immobiliser unit. Fitted with a new mohair hood and tonneau, this car has had over £20,000 spent on it during the last 2,000 miles. An impressive sports car with phenomenal performance, it is offered for sale with the distinctive registration number, B4 YUW. It is estimated around £30,000. The 1959 Jaguar XK150 Coupe may look very smart in Indigo Blue with red hide and carpeting, but it is what’s under the bonnet that will appeal to most Jaguar enthusiasts. The car was modified to the personal specification of John Appleton, a renowned pre-War driver at Brooklands and was used for continental trips in connection with his business. The modified engine features a 3.8-litre Mk X bottom end with an E-Type sump and a Weslake gas-flowed big-valve cylinder head and at 6000 rpm the car can reach a theoretical 165mph in overdrive. When Jaguar World reviewed the car in 1994 it confirmed it would regularly cruise at 130mph on the Autobahns. Subject to extensive restoration in 2002, the ‘Appleton’ modifications were retained and more recently Cooper Craft have performed a thorough overhaul of the brakes, and aluminium Dunlop D-Type style wheels and new tyres have been fitted. This high performance XK is supplied with a wealth of information on Appleton, the car and the modifications carried out. Expect to pay around £22,000 to secure it. The 1985 Buckingham is a true one off, having been commissioned by a wealthy car enthusiast in order to produce a motor vehicle without compromising design or quality. It is understood to have taken eight skilled Aston Martin Lagonda craftsmen some two years to design and three years to construct, with a build cost estimated around £250,000. Using modern technology but with classically inspired coachwork design, the vehicle is based on a high tensile steel chassis with coachwork in hand-formed, double skin aluminium panelling. The ‘gullwing’ rear doors lead to an air-conditioned passenger cabin, finished in Champagne leather with rosewood trim and black leather. The coachwork is finished in two-tone Burgundy and Champagne and the bonnet sports an unique swan mascot designed by a prominent British artist and produced in solid brass. The radiator badge, produced by Garrards, the royal jeweller, is in gold and black enamel. Since completion, the vehicle has covered just 348 miles and it is estimated to sell for around £30,000.